In sacred geometry, Archangel Metatron, the angel of life oversees the flow of energy in a mystical cube known as Metatron's Cube, which contains all of the geometric shapes in God's creation and represents the patterns that make up everything God has made. These duties tie in with Metatron's work overseeing the Tree of Life in Kabbalah, where Metatron sends creative energy down from the top (the crown) of the tree toward all the parts of creation. Here's how you can use Metatron's Cube for inspiration and transformation. 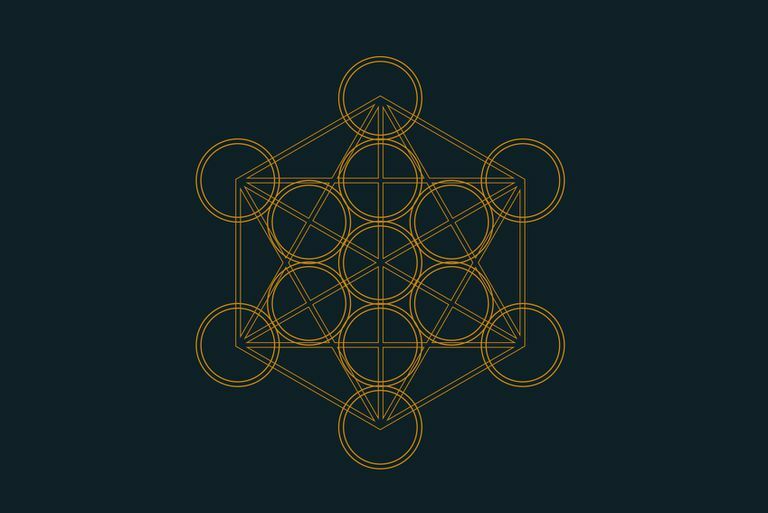 Metatron's cube contains every shape that exists in the universe God has created, and those shapes are the building blocks of all physical matter. They are known as Platonic solids because the philosopher Plato linked them to the spirit world of heaven and the physical elements on Earth. Those three-dimensional shapes appear throughout creation, in all everything from crystals to human DNA. In her book "Metatron: Invoking the Angel of God's Presence," Rose VanDen Eynden writes that studying Studying sacred geometry "leads one to an understanding of how Creator has structured the physical world around us. Within this plane, certain patterns emerge that point to its unity and connection to a Divine Mind that created it. Timeless geometric codes underlie seemingly disparate things, showing the parallels between patterns in snowflakes, shells, flowers, the corneas of our eyes, the DNA molecule that is the building block of human life, and the galaxy itself in which Earth resides." In his book "Beautiful Schools," Ralph Shepherd sees the cube as a symbol of how God made shapes fit together throughout creation and how he designed people's bodies and souls to fit together. "The cube represents the three-dimensionality of space. Within the cube lies the sphere. The cube represents the body with our third-dimensional reality, of manifested thought. The sphere within represents the consciousness of spirit within us, or, as is commonly known, our soul." The cube is an image of God's energy flowing through Metatron to all the many parts of creation, and Metatron works hard to ensure that the energy flows in the proper balance so that all aspects of nature will be in harmony, believers say. "Metatron’s Cube helps us realize the harmony and balance of nature," writes VanDen Eynden in "Metatron." "Since it depicts an equilibrium in the six directions represented within it. ... Metatron’s Cube can be used as a visual focal point to connect with the archangel, or it can be used as a concentration tool for meditations that promote peace and balance. Place an image of the cube anywhere you wish to be reminded of the archangel’s loving, balancing presence." People can derive inspiration from Metatron's cube in sacred geometry and also use it for personal transformation, say believers. "Ancient scholars believed that by studying sacred geometry and meditating on its patterns, inner knowledge of the Divine and our human spiritual progression can ... be gained," VanDen Eynden writes in "Metatron." In her book "Archangels 101: How to Connect Closely With Archangels Michael, Raphael, Gabriel, Uriel, and Others for Healing, Protection, and Guidance," Doreen Virtue writes that Metatron uses his cube "for healing and clearing away lower energies. The cube spins clockwise and uses centrifugal force to push away unwanted energy residue. You can call upon Metatron and his healing cube to clear you." Virtue later writes: "Archangel Metatron has insights into the malleability of the physical universe, which is actually composed of atoms and thought energy. He can help you work with universal energies for healing, understanding, teaching, and even bending time." Stephen Linsteadt writes in his book, "Scalar Heart Connection" that, "Metatron’s cube is a symbol and a tool for personal transformation. ... to listen deeply with the ear within the chamber of our heart so we can connect to the Infinite. ... Metatron’s cube contains many geometric symbols for the unity of the finite with the infinite." Who Are the Angels on the Kabbalah Tree of Life?